This iris was completed during a class I took at Thimbles and Threads in Draper, Utah. 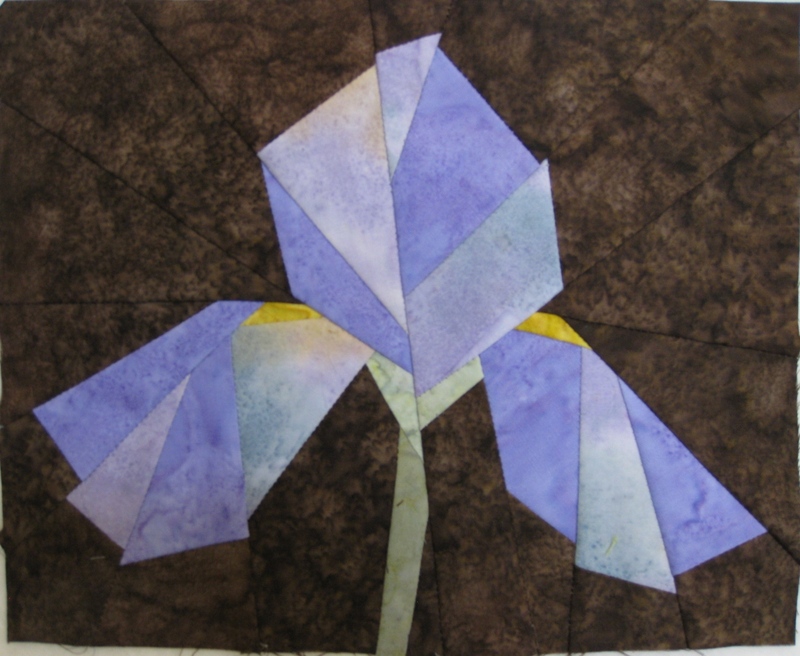 The class was taught by Lea Hardee, using Ruth McDowell's straight line method of piecing. Although not for beginners, it was a lot easier than I thought it would be. Batiks are so awesome, aren't they? Ruth has published many books. The one I have is called Design Workshop, and I find it indispensable in my library. If you also enjoy creating landscape quilts, you may want to have at least one of her books. This will be the center block of my next quilt. I wonder what will surround it... I will post a picture as soon as I start working on it. This flower is naturally beautiful and it is well represented here! Congrats! Thanks, Miriam! I need to learn how to do the curve pieced method by the same author, then I will be ready to roll! Denise, your quilting is wonderful and the quilt is lovely!